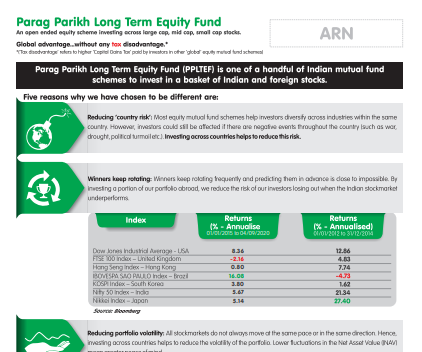 Parag Parikh Long Term Equity Fund (PPLTEF) is one of only a handful of Indian mutual fund schemes to invest in a basket of Indian and foreign stocks. Most equity mutual fund schemes help investors diversify across industries within the same country. However, investors could still be affected if there are negative events throughout the country (such as war, drought, political turmoil etc.). Investing across countries helps to reduce this risk. Different markets perform well at different times and it is virtually impossible to predict who will be the next winner. Also, there will be times when the Indian stockmarket may underperform others. By diversifying abroad, we reduce the risk of our investors losing out when this happens. There are several world-class companies which do not have Indian subsidiaries who are listed. Also, there are innovative companies making certain products/services for which there are no Indian substitutes. When we invest abroad, our investors get a chance to benefit from the performance of such global leaders. Sometimes, the Indian subsidiary of a multinational company may be very highly valued, and hence not investment-worthy. However, its parent company may be available at much more reasonable valuation. We can take advantage of such situations. We employ the same time-tested principles of value investing while choosing both, Indian and foreign stocks. What about the foreign currency risk? We prefer to concentrate on stock-picking rather than forecast currency movements. However, we reduce the risk of our investors losing due to sharp currency appreciation of the Indian rupee, by hedging approximately 80% of our foreign exposure through Currency Contracts..
As the Forward rate of the Indian Rupee is usually at a premium to the Spot Rate, our investors often earn an additional yield (Currently 5-6% per annum), irrespective of how the underlying stocks perform. Please note: This yield may or may not sustain in the future, as it depends on factors like interest rate & inflation differentials between two currencies, which cannot be predicted with much accuracy. First of all, we prefer countries where stockmarkets are well-developed, good governance is in place, financial statements are prepared in English and stockmarkets are liquid. Within these countries, we seek companies which are large, have operations in multiple countries and are reasonably valued. Currently, we are focusing on companies listed mainly in the USA as we have access to a large universe of companies which possess all these attributes. Yes. As 65% of the portfolio will be invested in Indian companies, our investors will pay a lower rate of tax, as shown in the table alongside.